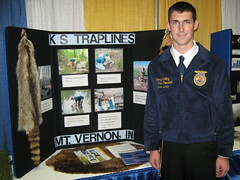 Kenny Schilling and K and S Traplines, 2009 FFA Agri-Entrepreneur. Kenny sees this business as a life long venture. Mike Rowe from Dirty Jobs, is the main keynote to the students of the 2009 National FFA Convention , October 21-24, 2009, Indianapolis, Indiana, USA. This video shared from the National FFA. Convention conversations from the 2009 National FFA Convention , October 21-24, 2009, Indianapolis, Indiana, USA. 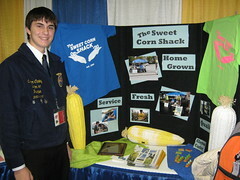 Clayton Carley and The Sweet Corn Shack, 2009 FFA Agri-Entrepreneur, branched out to catering and using T-shirts to spread the word. 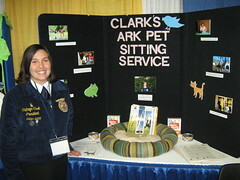 Cathryn Clark and Clark's Ark Pet Sitting Service, 2009 FFA Agri-Entrepreneur; hardest part to starting company? Buying the variety of food to feed the numerous pets. 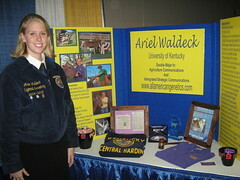 Ariel Waldeck and All American Genetics, 2009 FFA Agri-Entrepreneur, shares why she got into showing Brown Swiss Dairy Cows. 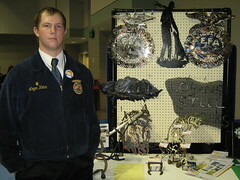 Logan Kotar and agri art, 2009 FFA Agri-Entrepreneur. Logan shares what he uses to create his art and why he chose this business idea. NIAA 2009 Annual Meeting The Changing Face of Agriculture, March 31 - April 1, Louisville, Kentucky, USA. Get the 2009 The Changing Face of Agriculture html large widget and many other great free widgets at Widgetbox! Frank Beurskens - Meal Planning in the Supermarket Aisle: What consumers are telling us. Meal Planning in the Supermarket Aisle: What consumers are telling us. Frank Beurskens, Co-Founder and CEO, ShoptoCook™, Inc.